The Century 16 movie theater early on Friday morning, July 20, 2012. A 24-year-old man gave himself up to police after telling them he “possibly” had explosives in his home. 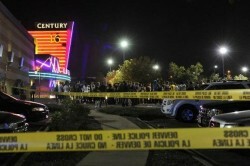 Claiming 70 victims, 12 confirmed dead and 58 injured, the mass shooting Friday at a movie theater in Aurora, Colorado, about 10 miles from Denver, is the worst mass shooting in US history. Cinema goers were 30 minutes into a sold-out midnight screening of the newly-released third installment of the Dark Knight Batman trilogy, The Dark Knight Rises, when someone described by witnesses as dressed “entirely in black” in full SWAT/riot gear – including gas mask, ballistic helmet, bullet-proof vest, bullet-proof leggings, throat and groin protection, and black tactical gloves – entered an emergency side exit of the theater. There’s more to this story than meets the eye, however. 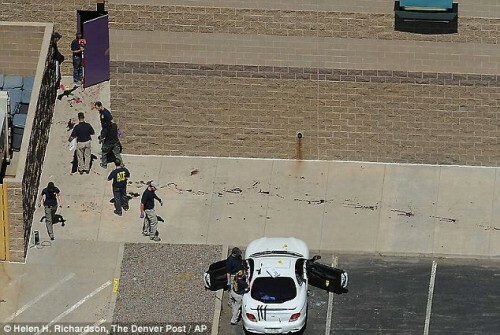 The chief suspect is 24-year-old James Holmes, a graduate medical student pursuing a PhD in neuroscience at the University of Colorado. He had no previous history of trouble with the law. 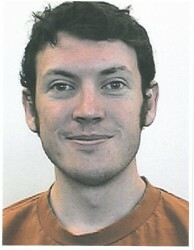 24 year old student James Holmes, who was studying towards a PhD in neuroscience until he apparently dropped out in June. How many times before have we come across this glaring inconsistency between the cold hard facts of a shooting and the real character of the chief suspect? The ‘crazed lone shooter’ has no history of violence, let alone psychopathic tendencies, is evidently very intelligent and has great character references from friends and colleagues. It’s always possible that he was hiding a dark side, but a medical student planning such an attack with tens of thousands of dollars worth of weapons, armor and sophisticated explosives, on his own and of his own volition, takes us into the realm of the bizarre. Holmes was apprehended within minutes of the 12:39 a.m. shooting at his car behind the theater, where police found him in full riot gear and carrying three weapons, including a AR-15 assault rifle, which can hold upwards of 100 rounds, a Remington 12 gauge shot gun, and a .40 Glock handgun. A fourth handgun was found in the vehicle. According to police sources, Holmes told the officers arresting him that he was “The Joker,” referring to the villain in the second installment of the Batman movie trilogy, “The Dark Knight.” He also warned police that he had booby-trapped his apartment, leading officers to evacuate the Aurora apartment building. Police Chief Dan Oates said today that police and bomb squads have found a large number of explosive devices and trip wires at Holmes’ apartment and have not yet decided how to proceed without setting off explosions. Federal law enforcement sources tell ABC News that Holmes bought a ticket to the movie, slipped out of the theater once it began and propped open the emergency exit before gathering his weapons and gear and coming back into the theater. Once inside, he opened fire. So Holmes probably had an accomplice. That makes sense because last time we tried, you can’t walk through an emergency exit from the outside without it being opened from the inside. Victim: Jessica Ghawi, an aspiring TV presenter, was one of the 12 people shot dead in the massacre. She was tweeting about her excitement at seeing the film until moments before her death. She also narrowly avoided meeting a similar fate in the mall shooting in Toronto on 2 June this year. One of the victims was young sports blogger named Jessica Ghawi. She was sharing her excitement about the screening via Twitter right up until the moment all hell broke loose. In yet another bizarre turn of events, it turns out that Jessica nearly met an identical fate on just six weeks ago. Ghawi blogged at length on 5th June about surviving the Eaton Centre mall shooting in Toronto that killed two and injured several others. I can’t get this odd feeling out of my chest. This empty, almost sickening feeling won’t go away. I noticed this feeling when I was in the Eaton Center in Toronto just seconds before someone opened fire in the food court. An odd feeling which led me to go outside and unknowingly out of harm’s way. It’s hard for me to wrap my mind around how a weird feeling saved me from being in the middle of a deadly shooting. What started off as a trip to the mall to get sushi and shop, ended up as a day that has forever changed my life. I was on a mission to eat sushi that day, and when I’m on a mission, nothing will deter me. When I arrived at the Eaton Center mall, I walked down to the food court and spotted a sushi restaurant. Instead of walking in, sitting down and enjoying sushi, I changed my mind, which is very unlike me, and decided that a greasy burger and poutine would do the trick. I rushed through my dinner. I found out after seeing a map of the scene, that minutes later a man was standing in the same spot I just ate at and opened fire in the food court full of people. Had I had sushi, I would’ve been in the same place where one of the victims was found. My receipt shows my purchase was made at 6:20 pm. After that purchase I said I felt funny. It wasn’t the kind of funny you feel after spending money you know you shouldn’t have spent. It was almost a panicky feeling that left my chest feeling like something was missing. A feeling that was overwhelming enough to lead me to head outside in the rain to get fresh air instead of continuing back into the food court to go shopping at SportChek. The gunshots rung out at 6:23. Had I not gone outside, I would’ve been in the midst of gunfire. 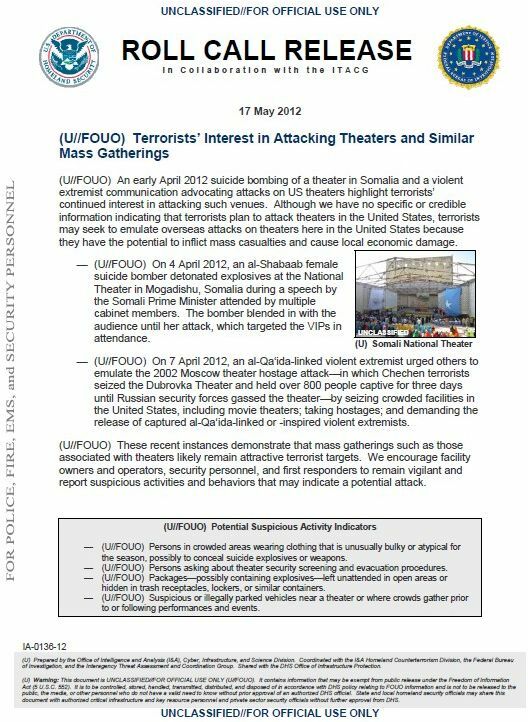 Then there’s this FBI Roll Call Release published on 17 May declaring that terrorists are “interested in attacking theaters”. How about that for incredible foreknowledge? First al Qaeda and forest fires and now this. All that remains is to concoct some connection between Holmes and anything Islamic and the US media will have a field day. You can download the ‘Roll Call Release’ here. Trail of blood: A line of blood leads from the emergency exit of the cinema, from where someone entered the theater with the help of an accomplice from the inside. The mass shooting ended when the gunman exited by this same door, downed his firearm and surrendered to police. The car in the foreground belongs to the suspect. Here is yet another sickening and bizarre ‘coincidence’. One of the pre-movie trailers paired with Dark Knight Rises was soon-to-be-released Warner Bros movie Gangster Squad, in which there is a scene where a shootout takes place in a movie theater. So just half an hour before the real thing, the slain Aurora audience may have watched four gunmen burst through the screen and fire automatic weapons into the (fictional) audience. The Gangster Squad trailer was scheduled to be paired with 30% of all this weekend’s screenings of Dark Knight Rises until Warner Bros had swapped it with an alternative trailer. Even if the Aurora audience did not see this trailer, it is still a rather startling ‘coincidence’. Dark Knight Rises itself features a villain named Bane who wears a bulletproof vest and gas mask. 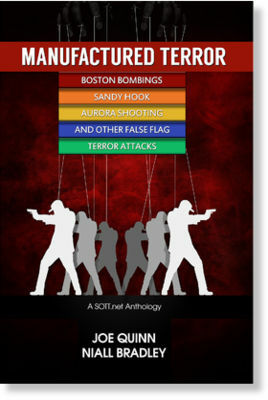 Trailers for the movie show explosions at public events including a football game. Given that the details surrounding this shooting point to it being a manufactured event, and that it comes on the heels of the bombing in Bulgaria, we again come to the conclusion that there is a concerted effort being made to spread fear among the global population and thereby reinforce people’s dependence on ‘strong leaders’ to keep them safe from an existential threat – in this case, ‘terrorists’ and terrorism. The true (and very present) threat to humanity however can be measured by the extent to which the people buy into this manipulation and allow it to obscure the fact that our planet is currently undergoing a major change in the form of severe ‘earth changes’ that may herald an approaching ‘sixth extinction’ against which our ‘strong leaders’ are powerless to protect us. 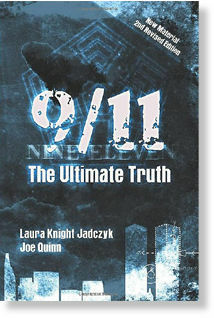 In addition, it may be possible that the extent of the ‘earth changes’ chaos on the planet at present (and in upcoming months) can be either mitigated or exacerbated depending on whether the masses of humanity begin to wake up to what is going on around them or continue to be bamboozled by the diversionary tactics of the ruling elite. It is sad that we can't tell where these random shooting rampage are going to happen as people are capable of such atrocities. The best we could do is safe guard public places like commercial areas with better firearm detection.